As far as Google will tell me, SVG thumbnail previews used to be supported in older versions of Adobe Bridge, but I believe that this has not been possible since version CS4. As far as I was aware, Bridge could generate previews of any file it could open in any of your installed Adobe programs, with very few exceptions. So why is SVG being left out? Illustrator, Photoshop and Dreamweaver can open these files, so why can't Bridge show us something? Bridge is a fantastic tool for people who need to manage a lot of images. And that's what SVGs are: images. More and more are people sharing SVG illustrations and icon packs. This format bridges a gap between web developers and artists, in addition to improving user experience by offering sharp images on both desktop and mobile platforms. Why should we have to download additional software to manage these collections? One of Adobe's biggest goals has always been to streamline your workflow by improving integration between their programs. Please keep up with the changing times and offer support in Bridge for this growing file format. Bridge is an excellent media browser. It even previews PDFs. Why not support SVG previews? Good idea. It should be getting some previews for SVG on MacOS, but isn't for some reason. So this will take a bit of investigation. Sorry. I read somewhere that it used to have the ability. Should have double checked. I know Bridge itself had no SVG support, but apparently it did used to get OS thumbnails for SVG files, and somewhere along the way that broke (probably when moving to Cocoa on MacOS). I know that Bridge has had to disable OS thumbnails for a variety of file types where the OS thumbnailer was crashing often (especially on MacOS). Ugh. Thanks for the explanation. Sorry but SVG support is important to most web designers out there. I understand there are reasons but I don't understand why they are not working on a fix here. It's 2016 - non xml inline SVGs are all over the place. True. Understandable 4 years ago. I just tested the support of SVG in Bridge CS3 and CS4 (yep, still have them running in case some one needs a course in those old dogs). And CS3 indeed shows the small icons of SVG files (CS4 doesn't). My guess is that this is just because the contemporary system completely depended on pre-rendered icons, while latter ones might have turned to creating them dynamically. The icons are pixelated at some forty by forty size. QuickLook on my OSX Capitan works perfectly with (my) SVGs. SVG is an important format in any modern web developer/designer's arsenal. The SVG standard has been around since 1999 (!) and used to be supported in older versions of Adobe Bridge so it seems utterly ridiculous that it has not been reintroduced. People have been raising this on the official Bridge forums for literally years now - come on, Adobe. Yes, this extension is quite handy in a pinch. Less convenient if you have icons/illustrations in several different formarts sorted together, though. Come on, Bridge, this should be easy! Thank you for sharing the extension. The company I work for is designing all our applications in C# with WPF, so we use SVG/XMAL. I have over 2000 svg icons to rummage through and since Adobe Bridge has no SVG support I'm left opening them in Illustrator to make sure I have the right one. This extension will save so much time. Adobe... The days keep ticking by and soon Aviary Photo and Designer will be out to take you in in the Window(s) field. As soon as I can I'm jumping ship. Adobe, wake up! its 2016 and SVGs are widespread on the web. I have to use Mac Finder to preview my SVGS...ridiculous. Please add this support and stop ignoring the issue. Community lets get together blowup this thread on the forum. Even if you dont have a question, just reply with something and it will gain traction and get noticed...just make sure to click on "Vote" at the top right of this page. You can login with your Adobe ID. That there is no reply from Adobe, in English or in software, is disheartening. Bridge 2017 is out and SVG preview still does not work. Really looking forward to the day they implement this. I think meanwhile third party software for managing icons profit from this situation. I'd be interested in how you all temporary solved this problem? First thing I tried was moving my icons into the local „Creative Cloud Files“ folder, this way they were searchable with preview thumbnails online in the Creative Cloud Files. But finding an icon I want to use online to later pick it up for use on my harddrive just wasn’t too much fun. So the second thing I tried was IconJar. Searching, finding and using icons felt nice, but it’s still in beta at the moment and you kind of feel it. At least the app crashes and restarts veeery fast. In the end I didn’t like that my icons get copied into a local database (so i lost my file structure for the benefits of a database and I have multiple versions of icons local now). Third attempt: Since I love the nounproject and the development it took, I also gave the lingo app a shot. Working with it is fun so far, but not sure what will happen after the 30 days trail. During download and installation it felt like you’d pay for sure after 30 days are over, but I read something about free personal and local use on their page about pricing. Since I don’t plan to invest into an other cloud service and all I want is to work with my icons, this feels kind of a good solution for now. Yeah, Creative Cloud is not a fun way to look for assets. But that's another issue altogether. I don't think so. They said they were going to get it functioning without improvements first, and then we could hope to see some redesign. We should be at that place now, minus getting the AOM to be a real part of the install instead of an add-on. So maybe next version we'll see some difference? Hopefully being able to leverage uploading to the Adobe Stock site will in fact give Adobe management even more incentive to provide resources to Bridge, but I'm afraid we'll have to wait longer before we see if that's true or not. It is, after all, the only really logical hub for uploading vector and video, as well as photos, JPEG and PNG to the Stock site. I'm still hopeful. . .
Adobe? Anything you can tell us? This reply was created from a merged topic originally titled Bridge CS6 not generating thumbnails for SVG files. It was working in CS3... could it be an installation problem ? This reply was created from a merged topic originally titled Rendering a preview for SVG. SVG files do not have preview in bridge.. In this Photoshop.com forum post PECourtejoie advises to switch the XMP option on in Illustrator's Save dialogue. This adds appr. 25K metadata (including a preview resource) to your economic SVG file, so let's hope Adobe will implement a full and native SVG viewer into Bridge. Resaving with XMP data is not a valid workaround when you might have thousands of SVGs and generating new ones often. Using Bridge as a media browser is great until you run into standard media files that you're no longer able to preview. It's more than 1000 work days of anger about this issue today - so I thought it's probably the right moment to celebrate today's update to Bridge 2018 introducing a new and much more fun to look at "no preview available" image of fail. We can all start staring at it for the next years ... starting today. This is actually much more than any of us could expected from this update. I think mine is the same on Windows. I have even less to celebrate. WOW! This actually really looks a lot worse since the classy logo they developed for Internet Explorer 7.0 is involved. This won't bring back the tears I lost earlier today, but makes me feel better somehow. ;) So thanks for sharing. I've given up on Bridge. The new features are all aimed at photographers, because they get and need Bridge as the image manager in the popular Photoshop/Lightroom bundle. This was already mentioned in the comments some time ago by @Blake Gilchrist. An ok workaround for PC users (Mac users are still out of luck), but impractical if you have multiple formats in the same folder. Also? A little besside the point. Bridge should easily be able to handle SVG. Even more so now, 2 years after my original post, when the format is growing even more in use. It's shocking to me that there is still no SVG preview in Bridge and we're almost to 2018. If adobe suite wants to be the go-to creation tool for web and product design, not providing means to preview an asset type that is becoming more and more integral to the online medium is incredibly shortsighted. I totally agree. SVG preview in Bridge is direly needed (again)! BTW, what I also find EXTREMELY annoying is that Bridge, after all these years, is still not capable of properly previewing graphics with transparency! I mean, come on Adobe! How can this be so hard? Such a friggin' dreary, long thread. Adobe: what's the deal with no SVG previews? You want designers to migrate to XD, perhaps take the file formats seriously. It's simply anti-customer. No other way to explain it. Just adding my voice to this thread. At work I have to use Windows 7 and can't convince IT to install extensions. I'm stuck with Bridge CC and work with a lot of vectors. Adobe, you are just plain lazy and when individuals and companies are paying you top dollar to use your products, the least you could do is offer features that are being requested. How are we still waiting on this? This was posted 3 years ago. How are designers supposed to take Bridge seriously if even Adobe won't? What's the hold up? Adobe Bridge team is working on providing Transparency support. 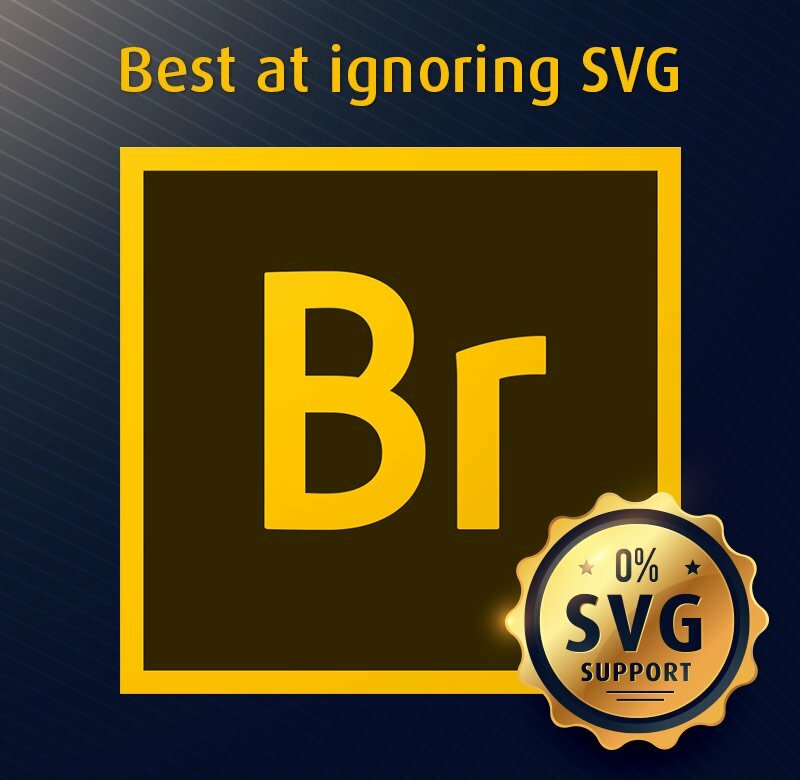 In the first go Adobe Bridge will provide transparency for PNG and SVG image format. No one asked for transparency of SVGs in Bridge in this thread. We need to have preview functionality which was there before CS4. Please fix your development/sprint planning if you think transparency is stopping people from working with bridge. Sorry for the confusion, what I mean by Transparency is that , Bridge will provide Support for SVG preview and also Transparency will be intact. Hope this helps. Hurray! we've been waiting for this for a long time! Thank you, I can't wait for this feature to come! Thanks a lot! Can't await the preview, too. Great! that Adobe Bridge team can see this is important feedback. Hello Adobe Team, you are working on the SVG preview for Bridge since 3 years now ... I make lots of SVGs and organizing them without preview is really annoying! Can you give us a release date? Finally some action! That's great to hear. Thank you for acknowledging the issue, Adobe. For those on Windows still waiting and looking for a solution, check out the SVG Viewer Extension for Windows Explorer extension. This is probably my preferred way of viewing SVGs as it means I don't have to have yet another application open. Come on Adobe team, this is just ridiculous (not as ridiculous as the chat I had with one of your support team members this afternoon, but still.) Please fix this, it's pathetic that Adobe can't make their own products work together! This topic should be closed and/or marked as resolved.